Inspired by her French grandmother, author Jamie Cat Callan shows women how to stop chasing perfection -- and start finding joy in life. As a young girl, Jamie Cat Callan was fascinated by her French grandmére. Though she had little money, Jamie's grandmother ate well, dressed well, and took joy in simple, everyday pleasures. As Jamie journeyed through France as an adult, she gained more insight into the differences between les femme Française et Americaine. Perfection isn't attainable, but happiness is. 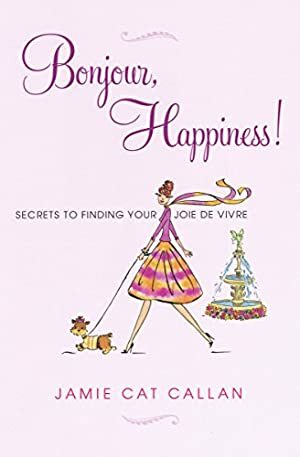 And this uplifting book, from the acclaimed author of Parisian Charm School, shows every woman how to embrace it -- and savor it. Log In to track Jamie Cat Callan on eReaderIQ. to be notified each time the price drops on any book by Jamie Cat Callan. to stop tracking Jamie Cat Callan. We started tracking this book on May 5, 2011. This book was $9.66 when we started tracking it. The price of this book has changed 71 times in the past 2,910 days. The current price of this book is $10.99 last checked one day ago. The lowest price to date was $1.20 last reached on August 14, 2018. This book has been $1.20 2 times since we started tracking it. The highest price to date was $14.20 last reached on May 3, 2018. This book has been $14.20 one time since we started tracking it. We last verified the price of this book about one day ago. At that time, the price was $10.99. This price is subject to change. The price displayed on the Amazon.com website at the time of purchase is the price you will pay for this book. Please confirm the price before making any purchases.